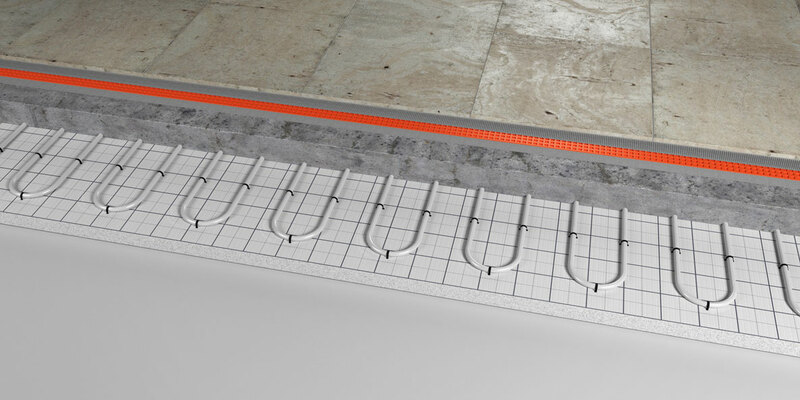 BaseTM Tacker underfloor heating system specifically designed for use within a screeded floor construction, offering design flexibility to accommodate irregular design layouts. The Tacker is a cost effective system offering excellent overall performance. BaseTM Tacker system to incorporate 16mm PEX pipe to be installed to laminated gridded insulation panel using polymer pipe staples. Staples fixed at 300mm apart. Installation in accordance with pipe layout design. Perimeter expansion edging strip to be installed to perimeter to prevent expansion of screed and thermal bridging. Pipe staples ensures secure pipe fixing during screeding process.